Disqus comment system Should you use it? Comments are integral part of any blog.It adds interactivity to your blog.Visitors can share their thought about your post . Sometimes it gives you idea for next post and sometimes it enriches your current post.Due to this each content management system ships with a inbuilt comment system. But with time comment system have become complicated.Social media have added to complexity.Now visitors want comment to be shared on social media,they might want to like or dislike a comment.From Administrator point of view Comment moderation and spam control has become important. Content Management system inbuilt comment system was able to cater above needs with help of plugins.But need for more powerful and dedicated comment system was also felt.So many third party comment system came into picture.Disqus is one of the third party comment system.Other major players are Livefyre and Facebook Comments. The word third party is used to denote that it is not a inbuilt comment system shipping with any content management system.It is not associated with any content management system.It is dedicated comment system supporting major content management system.You can also use it even if you are not using content management system.It also supports Tumblr and Blogger platforms. Lets understand SEO benefits comments offer before dealing with Disqus comments benefit.Comments are part of your post.So as comments increase content of your post increases.This will help you rank well for long tail keywords.I have posts where comments help me get top rank for few search keys (long tail ones only).So comments does have SEO benefits (if they are craw-able that is if search engines can see comments). Default comment system of Content Management Systems are crawl-able.But third party comment system by default were not craw-able.Facebook comments by default can not be crawled by search engines.But Disqus scores in this area.It is craw-able by search engines as per their website.So using them does not hamper your website comment SEO benefits. Disqus does allow visitors to share their content on popular social networking sites like Facebook and Twitter.With increasing importance of social media in traffic generation,promotion of your content and search engine ranking this feature is indeed important. Visitors can also sign in using popular social networking sites like Facebook,Twitter and their gmail accounts.It also detects the social networking site (above two) user is signed in with and bypasses this step. The user interface is pretty simple.You can moderate your comments from WordPress dashboard or Disqus dashboard.Automatic Spam filtering also eases task of moderator. You can also enable Akismet spam service by entering your Akismet api key on dashboard.This is on top of spam filtering service provided by Disqus.The default spam filtering system of Disqus works pretty well.I had pretty good experience using them.I was not using Akismet along with it. I have used Disqus in past.The comment system does load fast.Since speed is one important parameter to consider these days it does score well in this field. At the end of comment box Disqus displays subscribe option.Visitors can use this option for subscription.So you do not have to use a separate subscription plugin for comments.This is indeed a good feature to have. Disqus comment system is mobile ready.If you are using responsive methodology to cater mobile visitors then Disqus fits your requirement without any modification.It adapts itself if visitors comes from mobile.Facebook comments can also be made responsive but that requires additional configuration from your part. All the features mentioned above are present in other third party comment system in one form or other.The user interface may differ.But recently Disqus rolled out new feature Discovery which allows you to make money with Disqus. This feature indeed separates it with other comment system.Disqus discovery also increases your traffic as well.You can see the earning as well as traffic generated from Disqus discovery on Disqus Analytics dashboard. You can use this feature only for traffic as well.There are levels of customization.You can select between maximum revenue and no revenue as well.This helps you manage number of ads to be displayed. 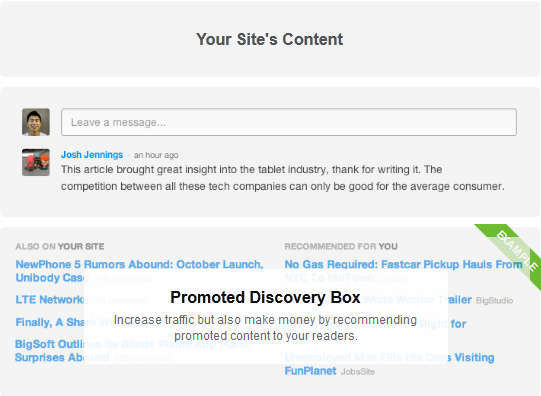 Disqus Discovery ads are fully compatible with your existing advertisement system like Google Adsense.The ads are displayed either above the Disqus comment box or below it.These are predominantly textual ads and affiliate links. On the discovery page you will have three options maximum increased traffic and revenue,traffic and revenue,increased traffic and comments only. You can select the first option (this may increase number of ads displayed on your website).You can see the format of ads that will be displayed on your website on the page itself (just scroll down a bit). To disable the feature all you have to do is select the last option (comments only). Next to Settings option you will see Analytics option.Click on the option. On the page displayed you can see Discovery option.Click on the option. You can see traffic and revenue generated from Discovery.It is not detailed enough now.Since this service is still in initial stages we can expect this to be more detailed with time. You will get paid using Paypal.It may add other payment methods in future.But Paypal is the only payment method supported. Disqus does offer official plugin for most popular platforms and content management systems.But in case you do not want one extra plugin and get maximum speed then use universal code.You can tune some parts of universal code to make it faster. Below is the code you can use on your site.You will have to replace udinra in below code with your Disqus short name.The only other modification need is adding #disqus_thread to href attribute of your link.This customization depends upon your content management system themes.So I am not going into details to this. You can compare above code with universal code.The only major change is on line containing src inside the function.I have also deleted noscript and link part of first code.You can enable them too. Disqus is powerful and have lots of features but this takes away the simplicity from it.Non technical users are not very comfortable using it.They find Facebook comments or default comment box much more friendly.WordPress comments are very simple and Facebook comments are very familiar. Advance feature offered by Disqus like sharing comments is often not much used by non technical users.Also by default Disqus comment system shows Best comment thread.But visitor might be interested in newest comments and may not have idea to see that. The problems mentioned above takes place for non technical or not to familiar peoples.If your blog belongs to non technical niche then they might take some time to get used to it.Also with wide spread usage of Disqus people might get used to advanced features of Disqus. My aim for this post was to give you idea about Disqus comment system and thus help you make decision.I have used Disqus on this site.It is one of the best third party comment system and is widely popular.From my own experience it works pretty well.But you should always check response of your visitors. You can try this comment system for say one month and see impact of it.This is the best way to decide whether to use this comment system or not.I have tried different comment system on this website.Sometimes combination of comment system was used.I decided my comment system plan after taking input from my visitors (comments made during that period). Consider sharing this post if you found this useful. 8 comments Disqus comment system Should you use it? of how they want to comment. very Helpful and informative blog thanks for sharing. The reason is my visitors are more comfortable using facebook comments and builtin comments instead of Disqus..You should always put your visitor comfort first..
How Funny. Compare This post and this page comment system itself. This Comment is using Facebook.